The 21st annual largest meeting of CPAs in New Jersey each year. 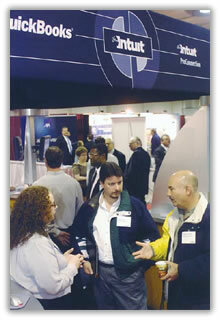 The 22nd annual Show for New Jersey CPAs and business customers. Plan to exhibit at the largest meeting of CPAs in New Jersey in 2015. This annual event will assemble over 1,200 CPA members and accounting and business executives for this show. Location-Location-Location. The Show is in North Jersey, within driving distance of 70% of the CPAs in the State. The Show is next to major freeways and highways to speed these CPAs to the Show. Free parking, low-cost CPE sessions, a free show and a low-cost food service in the exhibit hall will create a captive audience for you. New Technology Featured including Digital technology, Mobile, Cloud, Internet, iPad and iPhone, portals and online systems, banking, brokerage, insurance, business systems, financial and business services. Major Sponsors include National Conference of CPA Practitioners (NCCPAP), Intuit, Wolters Kluwer, ADP, Sage, Thomson Reuters, BNA, CPA.com (formerly CPA2Biz), AccountingToday, SourceMedia, AccuntingWEB, Journal of Accountancy, The Progressive Accountant, CPA Practice Advisor, AccountantsWorld, The Tax Adviser, CPA Trendlines, New Jersey Chamber of Commerce, among others. The Meadowlands Exposition Center is a no-hassle facility where exhibitors can do their own work. Each exhibit booth comes with a free complete booth package. The package includes carpeting, draped table, chairs, curtain back wall and side dividers, sign and waste basket. This is included in your booth rental. All you have to do is bring your pop-up booth and your enthusiasm. Booth rental is $2200 per single booth. Island spaces are $8800 for Gold Sponsors. Sign up early, we expect the Show to be sold out. For past exhibitors, this is your opportunity to submit your non-binding application for exhibit space. We anticipate a sold-out show, so we need to hear from you by online form, FAX or return mail. The space rate is $2200/per single booth. Double spaces will be $4400. Island space is available for $8800 which would automatically qualify you as a participating sponsor. A complete package of services is included in your booth rental.